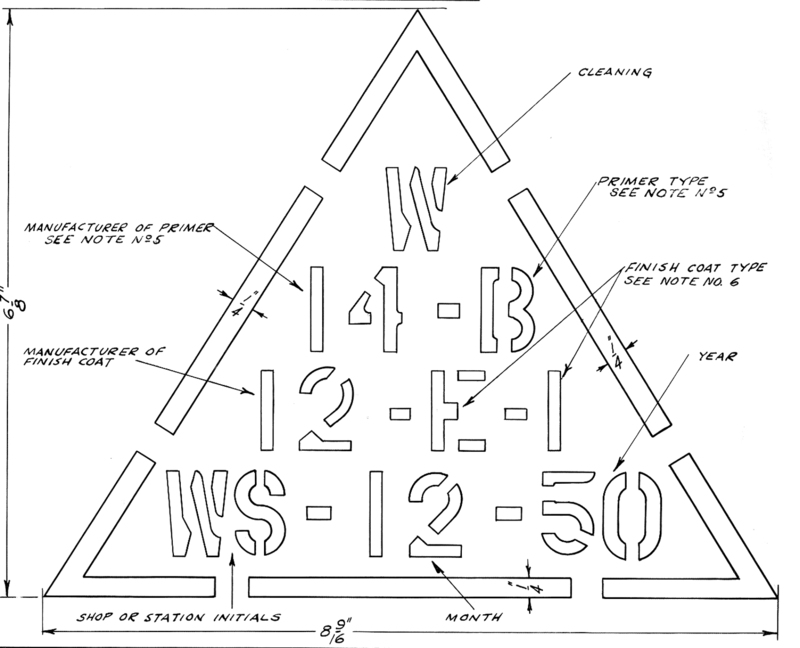 Paint Code Triangle: Starting around December 1950 - NYC cars had a small 6-7/8" x 8-9/16" triangle applied to the bottom left corner of freight cars. 1" letters and numbers were used. The question that has been constantly asked over the years is - What does it mean ? Well - it was a stencil that indicated the type of primer and paint used on the car and when the car was painted. The top line was a code for how the car was cleaned prior to painting. 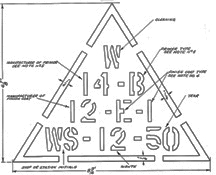 The second line was the primer manufacturer code and primer type code. The third line was the finish paint coat manufacturer followed by the finish paint type followed by the number of paint coats. The bottom was was the paint shop code followed by month and year. COOK PAINT & VARISH CO.
BENJAMIN FRANKLIN PAINT & VARNISH CO.
COOK PAINT & VARNISH CO. Note 1 - Mobil Chemical is a merger of C.R.Long Jr., American Marietta and Socony Paint Products. Note 3 - When no primer is used - the letter "O" is to be subsituted for symbols.